Provenance: Rolex Daytona "Lesson One" 50 exceptional examples of the world's most celebrated chronograph wristwatch, Christie's Geneva November 10, 201, lot 6. Rolex Daytona "Lesson One" 50 exceptional examples of the world's most celebrated chronograph wristwatch, Christie's Geneva November 10, 201, lot 6. Reference 6241 was produced approximately from 1966 to 1969. Scholars estimate that no more than 3000 pieces were produced during the model’s manufacture period, and only a small part of them with “Paul Newman” dials. 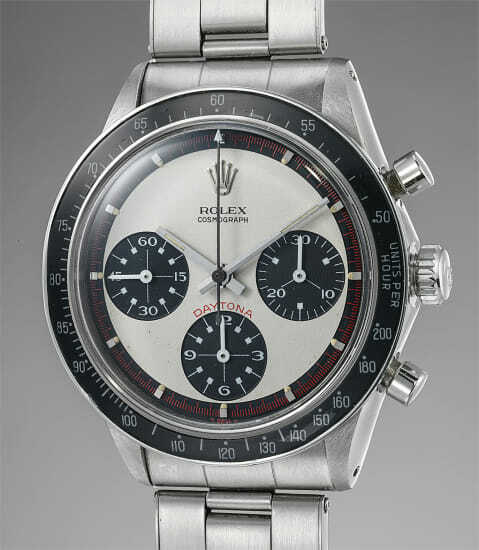 This particular piece has an impressive provenance - it was previously sold at the ground-breaking thematic sale "Rolex Daytona "Lesson One" 50 exceptional examples of the world's most celebrated chronograph wristwatch" on November 10, 2013. Featuring a dial configuration identical to Paul Newman’s “Paul Newman” watch, this reference 6241 is an exceptional example with an incredibly crisp case and extremely well-preserved dial. Featuring bold and crisp proportions, the watch has possibly never seen polishing throughout its over-50-year life span. Of particular note is the slanted “T Swiss T” designation at 6 o’clock, which is a particularity of references 6239 and 6241. Its "Paul Newman" successors on reference 6262 and 6264 would feature a flat "T Swiss T" at 6 o'clock. This particular ivory white dial displays hardly any signs of aging, and the luminous dots remain full and intact. Other details on this timepiece include the Mk 1 bezel, which is correct for reference 6241 and gives the watch a lot of presence on the wrist.